Moored comfortably at Thorne and took the time to seek out a mooring for a few weeks when I might be required to scoot off to Scunthorpe. A visit to Blue Water Marina was the first thing on the list and they were as jolly and welcoming as ever. With the weather being very iffy there were few people about but a mooring will be available when I need it in December - January. Not far from the marina is the railway station. Thorne South is the direct line to Grimsby and with a train every hour and a journey of twenty minutes the trip to Sunny Scunny should be a doddle. It has been suggested that a mooring might be on the cards in the creek at Barton on Humber. I will be looking into it of course but will need some decent weather to get there. Out from Keadby on a high tide then having reached Barton I would have to wait for the next high tide to get in. I will be taking advice on the trip this time. While we were at Keadby a gent came up and chatted about a boat that had an open day except that it was no longer in. 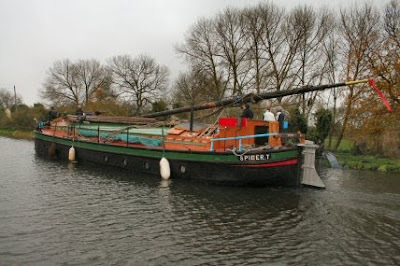 I knew the boat he meant for it was moored up at Keadby with its sails up the last time I was there. 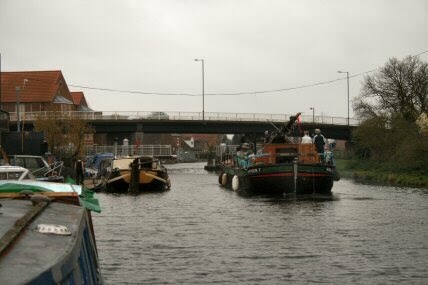 The reason that the Swinton moved was to let a bigger boat come in and the water in the canal had been increased by three inches for that purpose. Well today I found out what the boat was. 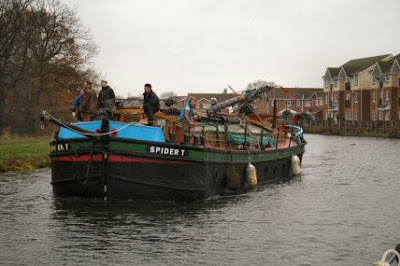 The Humber Sloop Spider T.
Spider T is an iron hull Humber sloop built in 1926 at Warrens Shipyard, New Holland, with a Gardner diesel engine, 200 hp. She was built for cargo carrying and worked as such until 1972. Later, she was sunk, refloated and used for the Rotherham Police Community Project. The present owner bought her in 1994 from the Sobriety Centre, Goole. SPIDER T has now been restored to her original condition on the outside with a period Edwardian interior. A traditional sail maker has re-created 1920s style sails of tan sailcloth; the last time she was fully rigged was in 1939. With an expert crew she can now sail in the waters she was built for. The sloop looks in really good nick but I bet it costs an arm and a leg to keep it running. The boat had someone going on ahead opening bridges for them. A great saver of time. I can imagine the length of time it would take to drop someone off and get through the bridge then pick them up again. Chance encounters like this are so rewarding! If you ever get the chance to have a look at Spider T she is lovely inside. The last time we moored at Keadby we managed to have a quick look inside, we where very impressed.